Srinagar is the silver lining in the sky of Jammu & Kashmir. The city is the perfect summer getaway cuddled in the Kashmir valley settled on the banks of River Jhelum. This page here has all the best options of heritage hotels in Srinagar. While the day slips by taking a tour of the city which is blessed with gardens, waterfronts, and abundant natural beauty. For that matter, a shikara ride in Dal Lake is the perfect way to live every second with happiness. After a tiring day, these luxury hotels make sure your night goes as pleasant as your day. Staying in Srinagar feels like a dream come true, with the mountains in the background, trees changing colors and the weather being pleasant than ever. You wouldn’t ask for anything that is more heartwarming than this. 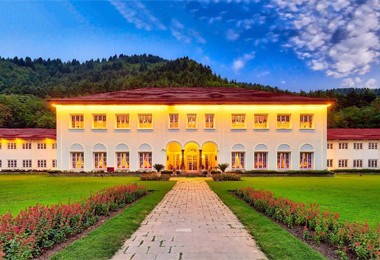 The luxury hotels in Srinagar bring forth an experience that lets you live the royal way. Every moment spent in the lavish environment will make you come back here time and again. Take a look at our list and make a choice for an unforgettable vacation in Srinagar.